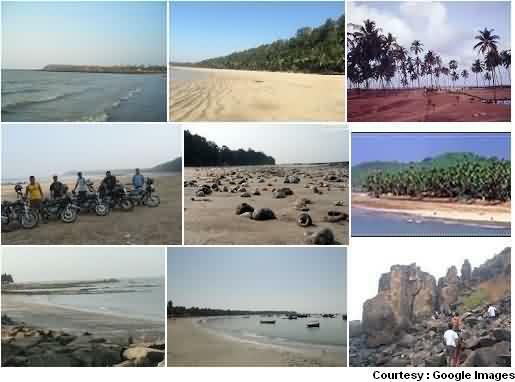 Manori village, where this beach is located is a coastal island location at North Suburb of Mumbai and can be reach by car, tourist bus or any private vehicle only via Bhayandar route. 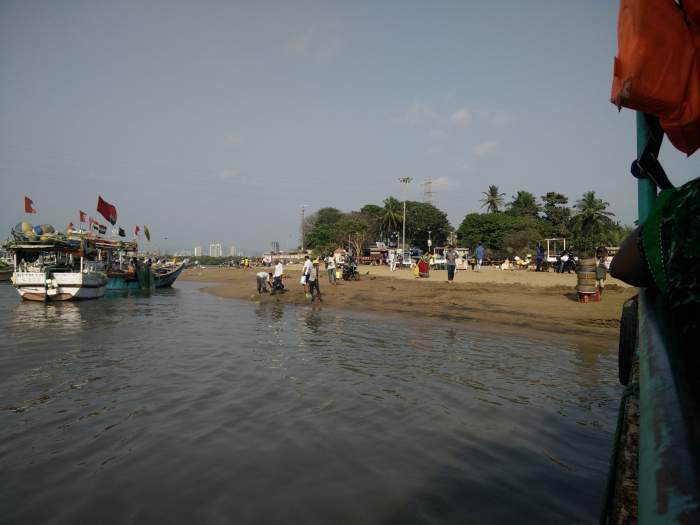 Otherwise Malad is the nearest railway station to reach via Marve beach ferry point, as one needs to cross the creek / sea area to reach other side of island where Manori and Gorai beaches are located. Manori is a semi rocky beach and is less crowded with very few people, couples and picnic groups seen. Although vendors like Ice Baraf Gola, Nimbu Pani (Lemon Juice), Coconut water seller are seen throughout the week. Weekends and Holidays is altogether a different scene here as people come in large groups for a day or overnight stay as this is also a wonderful weekend gateway. This beach is totally crowded and not very clean and litter are seen at shore along with little sea waste (Actually need to say, Human made waste) that washes away to manori beach shores. 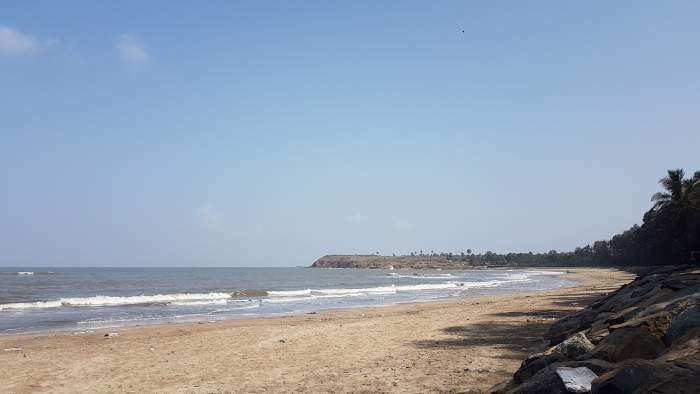 Overall, this beach is much better in terms of overnight stay, isolation, climate, cleanliness and greenery around compared to other famous city beaches like Juhu and Girgaum. A particular patch has a small rocky hillock which is a fun to climb and rest for sometime. Of course a thing of linking for couples. Sea food is particularly another attraction at these north beaches and a great treat if you are Non vegetarian and love fishes like Pomfret etc. Comparatively, Vegetarians have lesser options and from the available food outlets, very few have a great taste. Sunset is what one much not miss at such beaches. Vast flowing Arabian sea, Fisher boats and that sunset view is a must see and click click i must say. Sadly there are no water rides or adventure options available at Manori beach. The maximum you might enjoy is a boat ride inside sea and possibly Horse or Camel rides in weekends. So consider this beach for a great relaxing place within city limits, much cleaner and beautiful for a weekend break or a lovely outing with beloved and in group. Being serene, isolated and peaceful, its a beautiful sea location for family day out any day in week. Just that at times one might be taken back a little with few cheap group or crowd hanging around with all rowdy attitude and behaviour, which makes the surrounding bit uncomfortable for many with family and friends around. Otherwise weekend is perfectly crowded with nothing to fear around. Most of the resorts and small cottages are full during summer vacations and weekends are sure not for foreign tourists. But hey you are most welcome to actually feel the way Mumbai people enjoy their beaches. Another point to note is to carry enough cash as locations around beach area has hardly any ATM and those one or two available are many time without cash. One needs to go deep inside villages or drive down to far locations for emergency cash. Usually climate in summer is warm with temperature around 29 to 30 Degrees at beach front, But the breeze are still cool. Manori beach cilate is great during monsoon rainy days and winters too. Ample tourist volvo luxury bus and car parking options available, So not to worry about the biggest problem of Mumbai which is ‘PARKING’. If possible coming to this beach via a vehicle is preferred as auto options are comparatively less and weekends gives a real challenge on manori island. Note : No private vehicle / car can go to this beach via Malad as one needs to cross a creek. Although getting your bike on other side via ferry is possible. Malad Railway Station is on western railway route in Mumbai suburb towards North. One need to reach to Marve Beach Ferry point via bus or auto from where you need to cross the creek and reach Manori Island Village. If you plan to park your car around Marve beach then from Malad station in west head take S V Road towards Kandivali and in few minutes comes a T-Junction which leads to Orlem and Marve road. Go straight and upon crossing Link Road in same direction comes marve beach ferry point. Alternately, you can take Auto or Bus from Railway station to reach same location after which you take up a ferry. From Malad railway station, Road distance to Ferry point is 6.4 Km taking 20 minutes. Ahead of Malad, 5th Station towards North is Bhayandar Railway Station which is another location to reach this beaches like Uttan, Gorai and Manori. Its a longer route, yet road journey is worth as the greenery is awesome. Via National Highway 8, Get inside KashiMira and Keep straight. Few minutes drive on left is Bhayandar East West Flyover. Once crossed and reached Bhayandar west, Keep on Uttan Road following Essel World Sign Board which is located at Gorai. Few Km ahead of Gorai is Manori beach. On the same island of this North Suburb are multiple attractions (Beaches, Resorts and More) and here is best to my knowledge. If coming via Bhayandar on Uttan Road, There is a beautiful farm side picnic location called ‘Keshav Srushti‘ (Read for more details). Little ahead and you reach the first famous beach called ‘Uttan Beach‘. Few kilometres ahead on same road you will reach ‘Gorai Beach’, ‘Essel World‘, ‘Water Kingdom‘ and Global Vipassana Pagoda meditation centre. If you are beach lovers and want to explore few more beaches at not very far then you might also like to know about vasai virar beaches like Arnala, Rajodi, Kalamb which are far north suburb beaches in Thane district.